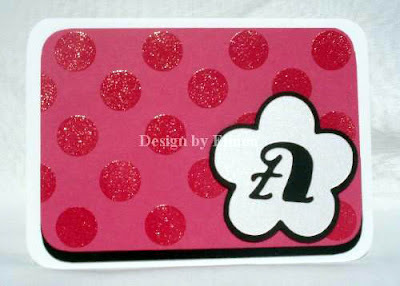 My Creative Time: Personalized Notecards for Aubre! I think I'm kinda addicted to my "Hello Kitty Font" cartridge right now! I used her to create these cute personalized notecards for my cousin who lives in Boston! Her birthday was last Friday, I just hope she already checked her mailbox because I held off posting this so she wouldn't see it before she actually received them! All cardstock is from PTI & I used clear embossing powder to emboss the polka dots on these cards! I thought they came out pretty classy! I think I may even make some for myself! What do you think? please leave a comment & let me know!! Scroll down to see my second post for tonight!